Reserve Bank of India's move to cut cash reserve ratio has been welcomed by analysts, writes Faisal Kidwai. 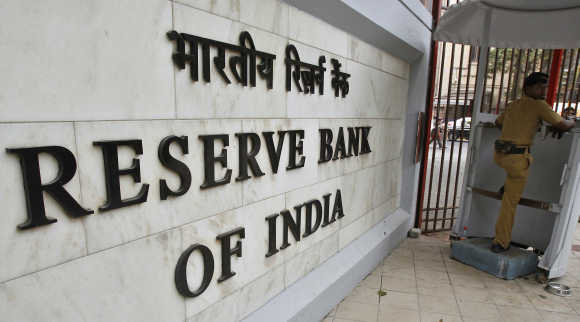 Taking a cautious stance, the Reserve Bank of India on Monday cut cash reserve ratio by 0.25 per cent - the percentage of deposits banks keep with central bank - but refrained from reducing lending rates in view high inflation. The RBI decision, which comes days after a slew of measures taken by the government to push growth, will release Rs 17,000 crore (Rs 170 billion) of primary liquidity into the system. The liquidity infusion, RBI said, would ensure adequate flow of credit to productive sectors of the economy. Image: The RBI decision will release Rs 17,000 crore of primary liquidity into the system. "Given the inflation bias that still continues in the economy and the twin deficit rate, they obviously did not want to take the route of the repo cut. So, that's why the repo rate cut has not been given in this policy," says Indranil Pan, Chief Economist, Kotak Mahindra Bank, Mumbai. But they have taken a preventive move of reducing the CRR because we have seen that liquidity too could tighten as in the second half credit remains on the higher side, so deposit growth are on the lower side, he says. Therefore, the gap between credit and deposit is likely to widen and there could also be certain shift to the liquidity side from a higher currency in circulation, says Pan. 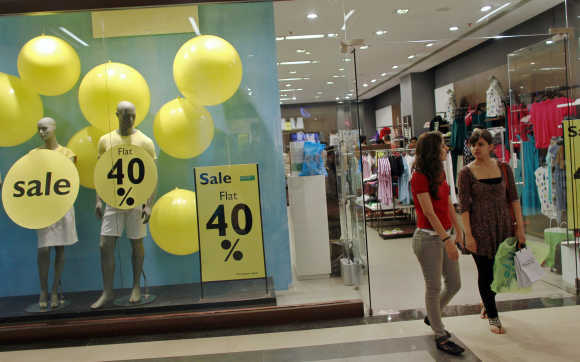 Image: Shoppers leave a retail store inside a shopping mall in Mumbai. "So, that's the preventive move they have done in terms of the CRR easing and they wanted to do it possibly in the policy rather than waiting and doing it somewhere mid-policy, so that's why they have given the CRR and not the repo," he says. Asked about what he expects from the RBI going forward, Pan says: "They will continue to be hesitant to do any repo easing, but definitely the bias has shifted more towards growth negativities rather than upside risk to inflation." 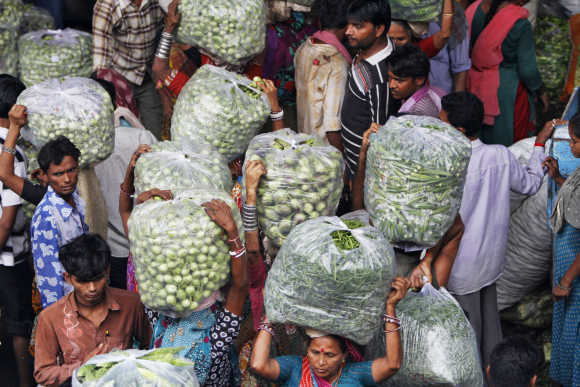 Image: People carry vegetable bags at a wholesale market in Ahmedabad. Jagannadham Thunuguntla, Strategist, SMC Global Securities, New Delhi, says: "High inflation and recent increase in diesel prices, which would further add inflationary pressures, might have led RBI to leave interest rate unchanged. Headline WPI inflation (year-on-year) has remained sticky at around 7.5 per cent throughout the current financial year." Meanwhile, the bank has reduced the CRR by 25 basis points from 4.75 per cent to 4.50, this would inject around Rs 170 billion of primary liquidity into the system, he says. 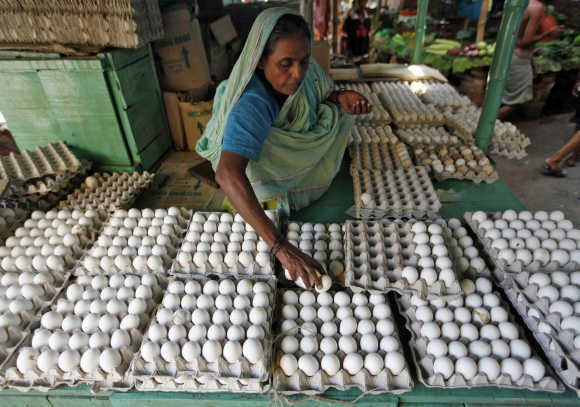 Image: A vendor arranges eggs for sale at a market in Kolkata. Cut in CRR was probably on anticipation that over the next few weeks the system may face liquidity pressure on account of advance tax payments and the onset of festival-related currency demand, says Thunuguntla. Explaining the bank's move not to reduce interest rates, he says: "In an environment of inflationary pressure and risk emerging from current account deficit, fiscal deficit and shocks emanating from external development, any policy action has to be conditioned by careful and continuous monitoring of the evolving growth-inflation dynamic." 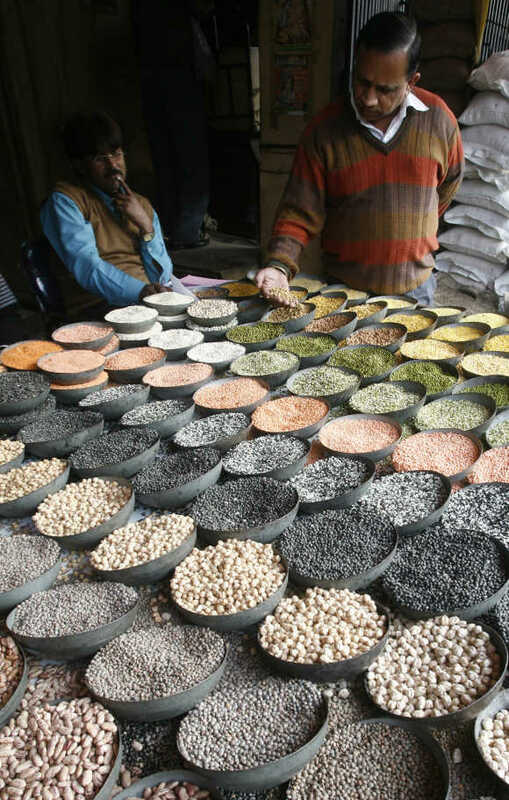 Image: A customer checks pulses at a wholesale market in old quarters of Delhi. Sujan Hajra, Chief Economist, Anand Rathi Securities, Mumbai, says: "It will be extremely difficult for the Reserve Bank of India to carry out any significant interest rate cuts at least until December." We expect the RBI to continue easing the liquidity through both cash reserve ratio cut and open market operation, he says. Talking about the government's decision to allow foreign direct investment, Hajra says: "The immediate investment prospect from these policies is unlikely to be substantial, but this is obviously a positive move given the kind of despondency prevailing in the country with respect to public policy approach." "We think it is more of a sentiment booster for the time being, but it is a good beginning," he says. 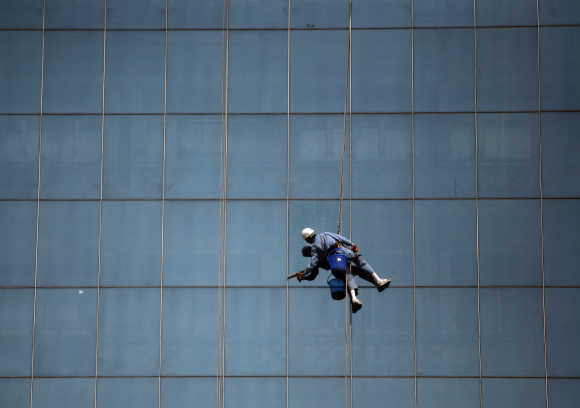 Image: A worker cleans the glasses of a building in the commercial hub of New Delhi. Why is the image of shining India tarnished? Indian economy: Half full or three-quarters empty?